I recently set up a new development workstation for my Surface Pro 2 to plug into when I’m at home. The desk is a lot more comfortable to use for long periods when when compared to using my old MacBook on my lap. The biggest part of my desk setup is the 29 inch Ultrawide (21:9) Dell monitor, which is significantly larger than the 10.6 inch screen on the Surface Pro 2, and much nicer to use when writing software. 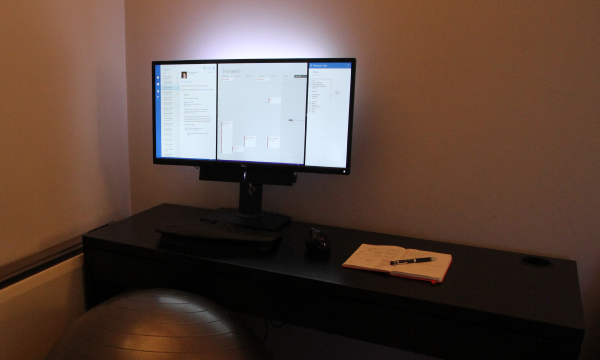 I have to say it has been really fantastic to have such a big, bright screen – but eye strain is a very real problem when working with computers for a long time. In my flat it’s especially problematic at night, and just about any time of the day in the darker winter months. Unsurprisingly, I’m more likely likely to be sitting in front of the computer at these times of the day, so something has to be done. In the past I have used software solutions to try and reduce the potential for eye strain; I highly recommend that people try using F.lux to change the colour temperature of the display. Changing the colour of the screen to a warmer glow is certainly easier on the eyes, but it comes at a cost of changing the colour temperature of everything the screen is displaying. I don’t mind the colours being warmer in certain circumstances, so I use F.lux all the time on my work laptop. I didn’t want to set it up on my Surface Pro 2, simply because the colour reproduction is really gorgeous on the tablet’s screen. So this time I thought I’d try a new approach to solving the eye strain problem. I’ve attached LEDs to the back of the monitor to give the screen some back lighting. There are two strips of white LEDs which are powered by the two USB ports on the underside of the monitor. I tried a few different arrangements of the strips, and I found that having the strips quite high up ended up with the best result, while the distribution is obviously greater at the top – it looks absolutely fine when you’re sat in front of the screen. The white LED back lighting is certainly on the blue-end of the spectrum when compared to the warm ambient light of the room, but it matches the cooler glow of my Ultrawide Dell monitor really well. 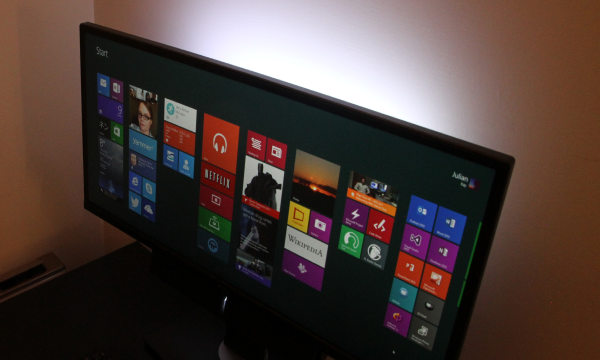 Coincidentally, the power LEDs on the monitor and sound bar also match the white back lighting. It’s a small detail, but it certainly helps the overall look of the setup. Less than a month in, and I’m already thinking that this will factor into my plans for all my future workstations. I feel like having good lighting around the computer really helps with concentration and reducing eye strain. 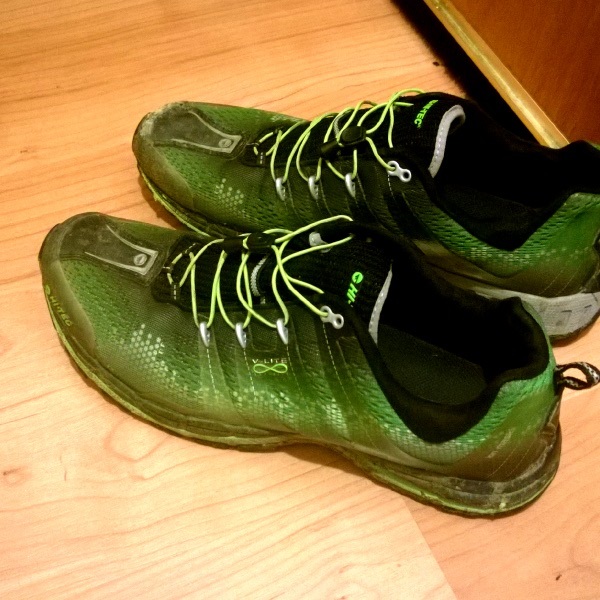 These days I use a combination of software and hardware to keep track of my health and fitness in a way that I never have been able to previously. There’s no one vender that covers everything I want, but the software I’m using all works fairly well with my Windows devices. Bing Health & Fitness is an application for Windows and Windows Phone which – as you may have guessed from the name – helps people with tasks related to health, and fitness. This is probably the most used software I have for actively recording information, and I use it every day. Entering diet information in to Bing Health & Fitness is fairly easy, there are a number of foods built into the database which you can select, or you can add your own with information about carbs, protein and fat – as well as calories. I have been using this on the Windows 8.1 app since it came out, but on the release of the Windows Phone app I’ve started entering the information on my Lumia more often than my Surface. Being able to enter this information on the phone itself is a lot more convenient and the live tile shows me the numbers, which also serves as a reminder for when I haven’t done it. 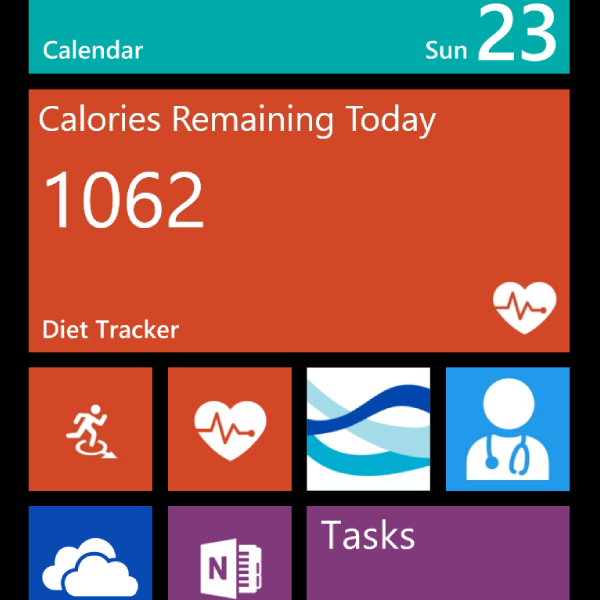 Another feature that the Windows Phone version introduced is the GPS Tracking. Previously I’d have to enter in data about exercises into the Windows app with guess work as to how far I’d gone. The GPS Tracking feature lets you simply start and stop exercise activity, and provides a map as well as statistics on the speed and estimated calories burned. I use this as well as my Fitbit statistics so that I can see the difference between actual exercise effort against normal day-to-day activity. 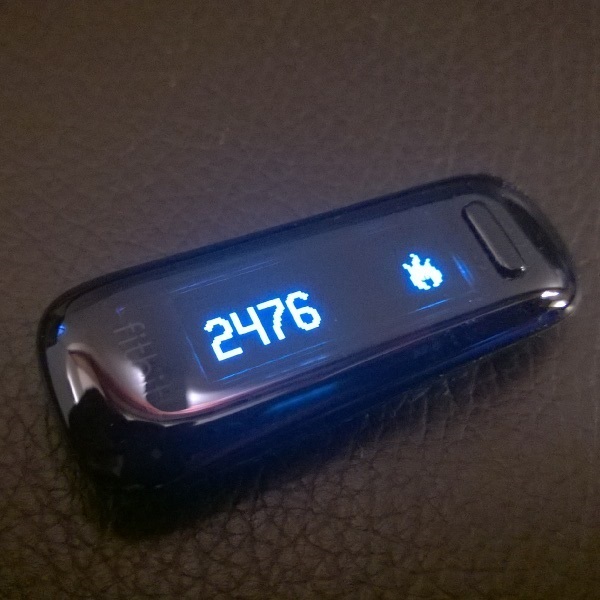 Talking of the Fitbit – most of the data collected by this device is done with very little input from me. I walk a lot more than I used to thanks to the statistics, but I don’t manually enter any information through the Fitbit app itself – as mentioned above, all the non-passive food and activity data is handled by Bing Health & Fitness. I’m very pleased to say that the Fitbit does a great job of collecting my information without me having to do anything at all. It doesn’t really matter which app I use though, as all of my information is stored in Microsoft’s HealthVault – an online service which allows secure storage of health and fitness information, which can be shared with friends, family or health care professionals. There are HealthVault apps for both Windows and Windows Phone which allow entry of information directly, as well as a website which allows some pretty comprehensive data exports – if you need them. Basic information like my height and weight are entered directly into HealthVault itself using the apps, and these measurements are currently done using ‘dumb’ methods – in other words, normal bathroom scales. Maybe in the future I might look at getting wireless scales – or even something more advance than that – though I see very little point at the moment. Every other bit of information collected by both Bing Health & Fitness and Fitbit are synchronised with HealthVault automatically. Another application that integrates with HealthVault is Health Choices, an app that’s also available on both Windows and Windows Phone devices. It acts as a front-end to the NHS Choices content provided by the National Health Service. This includes details about hospitals, surgeries and other places that are useful to keep track of. When saving these places, the contact and address information will also be saved directly into HealthVault. Health Choices also induces a A-Z of various treatments and conditions which can also be saved onto HealthVault – I’ve found these extremely useful in keeping track of medical history and medications taken. I’ve always had an interest in metrics and statistics anyway, and thanks to the technology available today with the Windows platform I’ve been able to really take control of these things. I’ve seen improvements in fitness and motivation, and the information in these applications has helped me make important decisions about where to get treated when I have been unwell. Obviously, none of this stuff would be as effective as having a personal trainer, nor does it replace having a professional doctor – but being informed definitely helps. Now that I’ve started keeping track, I’m not going to stop. In fact, I think it’s only going to get more comprehensive over time. 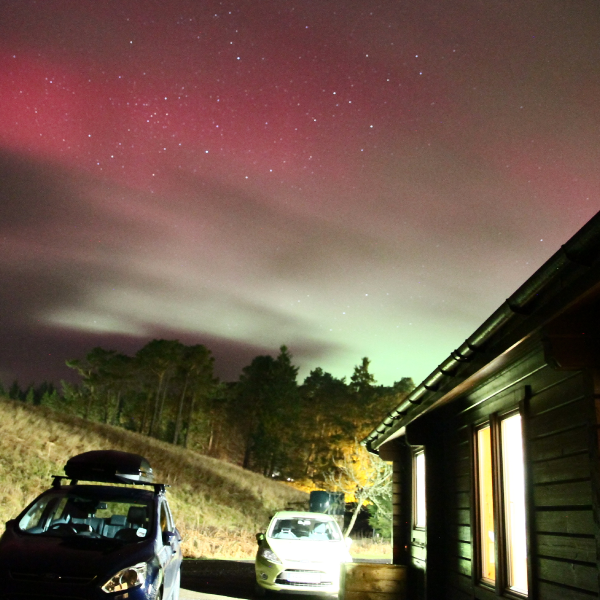 Last week I managed to find myself in Kielder around the time of the Kielder Forrest Star Camp which is held twice a year in the spring and autumn. 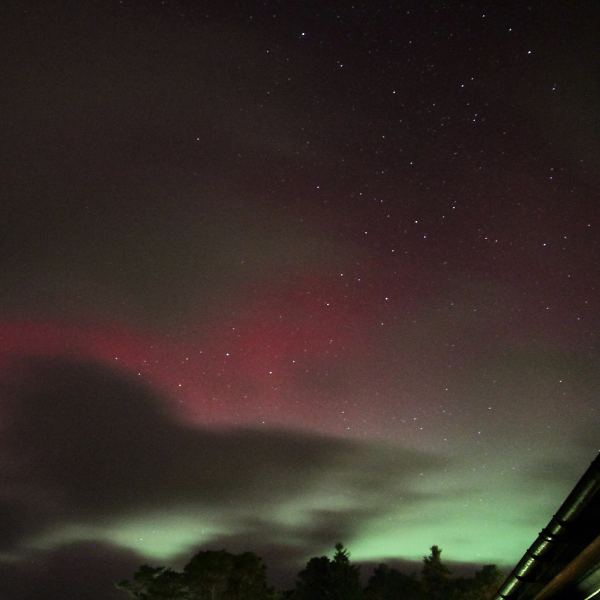 On the Thursday night the UK was graced with a fine show of aurora – however (as is usually the way with these things) most of the evening we covered by cloud and rain. I did manage to get a few shots though, and the above one is the first (not focussed!) photograph I took of the sky to try and work out if I could pick anything up – and I could! However you can already see the clouds starting to come in. Even though cloud covers most of the sky, you can really see the colour shine through the gaps in this photo. I only managed to get a few more shots before the rain kicked in, and unfortunately the next day there wasn’t a sign of anything green in the sky. This was my first experience of the aurora, and I was thrilled to be able to capture it.